F1Stockcars.com recently caught up with Paul Hines. Hi Paul thanks for taking the time out to chat with F1Stockcars.com, suppose we’d best start off with the boring questions. Not a problem. As you know I’m Paul Hines driver of the 259 car, I’m 27 [at time of interview – Ed] soon to be 28 on the 3rd December, my home town is Hinckley but I like to say Leicester because I am a big Leicester City F.C fan. In everyday day life I’m a Company Director of Progress Windows. Its been a big year (2008) in business, Derek (my Dad) was director of B-Warm Windows. Basically B-Warm was too big for the current climate and dad wanted to slow down a little. I took on the directorship of a new company in view of Dad stepping down and closing the old company. Ok that’s got that out the way. So Paul how did you become a Formula 1 Stock Car driver? Firstly I have always been a fan of F1 Stock Cars. Some of my earliest memories are at a Stock Car track, my first meeting was at Long Eaton, I was 5 or 6 at the time and remember it pretty well. We got there a bit late and arrived half way through a race. Dad would not tell me where we were going but I guessed when I could hear the cars racing as we walked up to the admission gate. I had been on at my Dad for weeks to take me and this night he finally had. So you were hooked from an early age then. Did you move into Ministox? I never raced Mini’s although I would have liked to. We could not afford it at the time. The first time I realised I was not a bad driver was Go-Karting with my now mechanic Graham Cotterell for his birthday. I remember finishing third against some F2 drivers and a couple of F1 drivers (Tim Warwick was particularly mean to me because I passed him. lol). Its strange how such a small thing can give you confidence to want to pursue something for the rest of your life. From that point, I thought I could make a decent Stock Car driver. Paul so what drivers do you remember sticking out and giving you that “Well I’ll learn from them!” feeling? I remember watching Rob Pearce (175), Gary Castell (247) and Gaz Bott (41) and thinking that if I learn all I can from these three drivers then I have every chance of becoming a half decent driver. So from watching them you jumped straight in the F1 then? No I started in V8’s [V8 HotStox – Ed]. Luckily I took to these pretty well. I won a Coventry final in only my 5th meeting. My V8 career was only ever a stepping stone to F1 but I thoroughly enjoyed my time in a V8. I met a lot of now close friends and it really set me up for F1’s. Do you remember anything about your first race in the F1 formula? My first race in an F1 was at Skegness. I was clever in that although I was a red top in V8’s I had taken out my F1 license when I was yellow so my starting grade in F1 would be white. I was not nervous in my first F1 outing at all. I was white and felt comfortable from there. There were only 40 or so cars and it was not a qualifier so I knew it would be fairly tame. I finished 4th in my heat. I was winning the final and Paul Harrison came past to take the lead. I had a dive next bend and got it completely wrong. I took myself out and Paul out. On the centre green afterwards Paul said to me “The best thing you can do lad, is stick to ****ing V8’s!” In the National afterwards I was winning again and Paul came behind me. Fair play to him he gave me a good hit but did not bury me. Paul went on to win and I finished 7th. So now you’re quite an established Stock Car driver in your own right, and took the European Championship Title in 2005, do you have any plans or desires to move out of F1 Stock Cars? I think I have always wanted to be a Stock Car driver. I have never wanted to drive anything else. I really do not envy Lewis Hamilton. I would get bored if I didn’t have a Smith, Lund or Wainman smashing into me on the first bend. I remember my Dad often saying that I would not be hard enough to race, but I always thought that I could be technically good even if I was not the most aggressive. That’s great to hear Paul. Keeping an F1 on track can’t be an easy task. Are you just the driver or do you pitch in with your team to keep it going? I do most of the work on the car myself, but I do get invaluable help when I need it. My Dad is great. He does all the undesirable jobs, such as painting and washing the car. He spends a lot time at the garage with me. Mark and Gordon also come up when they can. Its a godsend to get help during the week. At the track Neil and Graham keep me racing. They are great with the car and know what they are doing. If you are going to do the amount of meetings that we like to do, then you cannot race without such help. Its dangerous to add up the time I spend down the garage. We are there most of the time and luckily I have a very understanding girlfriend in Simone. Sounds like you spend a fair old bit of time down the workshop, So what do you have on the Hi-Fi then? When I am at the workshop I have to have the radio on. Not sure why, because most of the time you can’t hear it but I have to have Radio 1 or the football commentary on. Tuesday nights are usually my favourite nights because there is usually a game on to listen to. It would appear F1 Stock Car racing takes up pretty much all of your free time, is there room for any other interests? Outside of racing its difficult to have time for anything else but I do like to watch Leicester City. Always been a fan and always enjoy going to the Walkers Stadium on match day. I can’t stand shopping but Simone loves it, so often I find myself in a shopping centre somewhere offering a completely irrelevant opinion on a pair of size 6 jeans or high-heeled boots. I have never been drunk, so I would not really list socialising as a big aspect of my life. However, its good to go out with mates when you can. When you race Stock Cars you tend to drift away from old school friends and distant family members. Racing is your life and the people in it are your friends and family to a certain extent. Paul time to get all deep with you if you don’t mind, can you recall any ‘spot on advice’ you’ve been given in life so far? Can’t really think of one particular good piece of advice I have been given. I have been given numerous tips over the years. You have to learn quickly, but take your time in both racing and work. I am my own man and tend to do things how I want it done. I am sure I am difficult to be around when at work, but it’s just me and how I want things done. I remember reading something that Frankie Wainman Jnr once said in Neil Randon’s book [The Sound and The Fury – Ed] a few years ago. Success does not come quickly. It takes time, perseverance and hard work. Even if you have those three qualities you need to have skill as well. I think this is very true. You need to have so many qualities to be a success in any walk of life. Paul whats you favourite food / meal? Fave food. I am not a big eater but I do like a Sunday Roast. I remember Sam Wainman cooking me a dinner when I went up to Frankie’s yard once. That was delicious. Ideal holiday would be Skegness. Racing Tuesday, Thursday and then a Speed Weekend. We all watch a little TV when we can, maybe not as much as others on weekends do you have any favourite TV shows? Fave TV show. Can I just say Sky Plus is the best invention ever. I get to watch loads more TV now because I can record it and watch it when I’m not at the farm. I really like Spooks and Heroes at the minute. I always watch football when its on. I am so sad, in that I don’t watch soaps, but I think WWE wrestling is great. I know its not real but its my soap if that makes sense. Comedy. Any favourite TV shows or Stand ups? I am a big fan of stand up comedy. I have seen Lee Evans, Peter Kay, Frank Skinner, Jimmy Carr, Jethro and so many more acts live. I love it. Frank Skinner was the best. I watched Friends religiously when that was on TV too. Time for that old Desert Island Question Paul, What five C.D’s, Books & Films would take to a Desert Island? The five cds would be my ipod! I would have to have my ipod where ever I went. I love music and I have such a varied taste. My Ipod contains tracks by Manic Street Preachers, Mcfly, Usher, Dropkick Murphys, Slipknot, Herman’s Hermits, Wombats, G4, Johny Cash and everything in between. The five books I would take would be Harry Potter. There the only books I have ever read. I am not a big reader at all but loved Harry Potter. The films I would take would be Days of Thunder, Terminator, Transformers, Gladiator and Lord of the Rings. Lastly Paul, We all know stockcar racing ain’t no cheap sport, How do you manage it? Sponsors are a massive part of what we do and I have been lucky to have some great sponsors. Panic Transport have been a massive help over the last 5 years. They have helped us so much that without them we could not do the meetings we do. I know some of the lads that work there enjoy watching the car and so many people tell me that they have seen a panic truck on the road somewhere. Neil Stuchbury Mobile Tyre Services have been great too. I was able to let Neil have a go in practice in the F1 in a small way of saying thank you. JBS Commercials have been a really good sponsor too me. I like to think I have helped Ian and Jay by giving them all the help I can in their own racing pursuits. Its great to see team JBS on the track and I think could be one to watch in the future. Its nice to have Skegness Stadium on the car. Skegness is probably my favourite track and I am proud to be sponsored by the stadium. 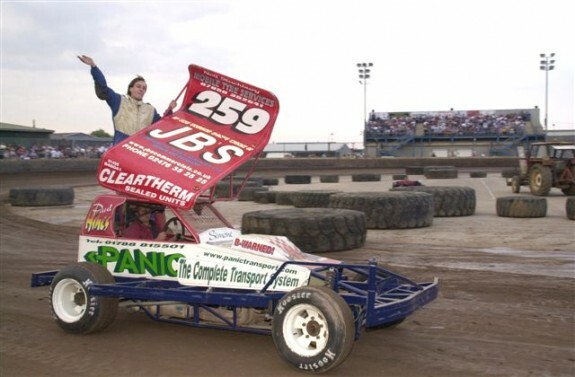 I will always do every Skegness meeting and hopefully again in 2009 we can show the cars in Skegness town centre to try and drum up some publicity for the track. Cleartherm Sales units have continually helped me from when I started in V8’s and Shanford Garage Services are a massive help too. I owe a lot to Mark and Micky Randell. They are better with the mechanics of a car than I am and there has been countless times when they have got me racing. Hopefully I can attract a few more sponsors in the future. Its a costly hobby and we need all the help we can get. Some people have the misconception that because we do a lot of meetings that we have loads of money to throw at the job. This really is not true. You make sacrifices to try and get to as many meetings as you can. I don’t drink, smoke or drive a fancy car. All the money we have goes on our racing. You will find most drivers are like that. Sponsorship to me quite literally keeps me racing. Thank you very much for your time Paul, It’s been great talking to you and getting to know you just that little bit more than ‘the driver of the 259 car’. – Paul Hines #259 (Interview conducted in November 2008).